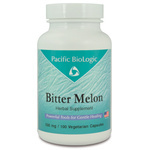 Bitter Melon (Momordica charantia) (Ku Gua) is a plant native to India and Asia. Evidence has shown positive effects on maintaining healthy glucose levels, glucose uptake, glycogen synthesis, and glucose oxidation already within normal levels. Active ingredients include charantin, vicine, and polypeptide-p. Contraindicated in pregnancy. 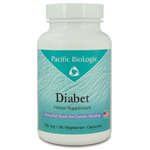 Helps regulate healthy blood sugar levels.